FIRST CHRISTIAN CHURCH was organized in 1850. The present building was designed by local architect, Walter Boschen, and is the congregation’s third location in the downtown area, replacing a Gothic revival building from the 1880’s. Completed in 1917, this Classic Revival style building features a coffered barrel vault ceiling of cast plaster and a revised Beaux Art organ case. The organ was built by E. M. Skinner as his Opus 273, comprising 22 ranks across 3 manuals and pedal. The specification was unusual in that the Great manual had only one independent rank, an 8’ Open Diapason, with other stops duplexed from a 15 rank Swell division. In typical Skinner fashion, the pedal division was also augmented by other duplexed stops, and the 16’ Open Diapason (wood) extended into the Great as a Philomela stop. In 1955, the organ was substantially rebuilt by W. A. Brummer, a Moller representative from Granite City, Illinois. Much of the Skinner pipework was replaced. The Great was moved to the original 4 rank Choir chest, and the Swell box was divided to form a new Choir organ, utilizing the duplex chests to serve the Great and Choir. A four manual console was added in preparation for the addition of a 7 rank antiphonal organ in 1960. The organ is still functioning on its unreleathered Skinner pitman chests and has a total of 34 ranks. 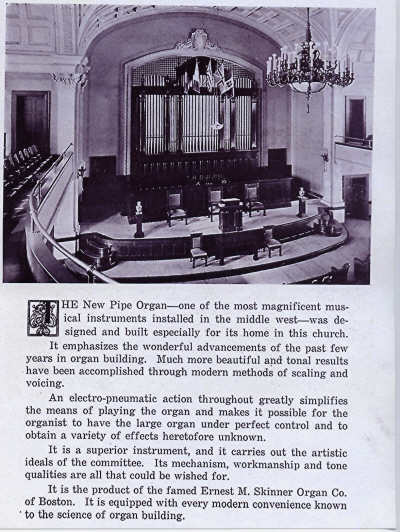 Original 1918 E. M. Skinner organ installation. The five flags at the top of the case represent the United States and her four allies in WWI, France, England, Belgium and Italy. Church organist Herbert Krumme opened the dedicatory recital on December 7, 1918 with the national anthems of these countries. Installation of the organ was delayed by the War. ABOVE: St. Joseph’s only four manual (keyboard) organ console controls the five divisions of the pipe organ in First Christian Church. The top manual controls the Antiphonal division, located in the rear balcony. The third manual controls the Swell division. The second manual controls the Great division, while the bottom manual controls the Choir division. The fifth division is the Pedal Organ, played with the feet on the pedalboard. Each division has a purpose in classic organ literature. The Great manual contains the foundation stops, used for leading hymns. The Swell division acts as its foil. The Choir division is used for choral accompaniment and as a foil to the Swell. As its name implies the Antiphonal division echoes the main organ. The Pedal division under-girds the manual division by supplying the bass line. Above the pedalboard are four flat pedals. The first three are sometimes called expression “shoes”, because on early organs, the pedal was shaped like a foot. These open and close the expression shades to control the volume of the Antiphonal, Swell and Choir divisions. The Great and Pedal divisions are unenclosed. The far right pedal is the Crescendo Pedal. It progressively draws all of the stops from softest to loudest, and works in reverse to create a diminuendo. The “rocker tablets” above the keyboards are “couplers”, which allow the organist to transfer the stops from one manual to another. For instance, the entire organ, except for the Pedal can be played from the Great Manual. Couplers also engage the octave above and below. The white buttons under each manual, called “pistons”, as well as the metal buttons on each side of the expression pedals, called “toe studs”, may be pre-programmed by the organist to make quick changes in the selection of stops, or registration, with a “free” hand or foot. LEFT: The Antiphonal division of the First Christian Church's pipe organ is installed behind the balcony. 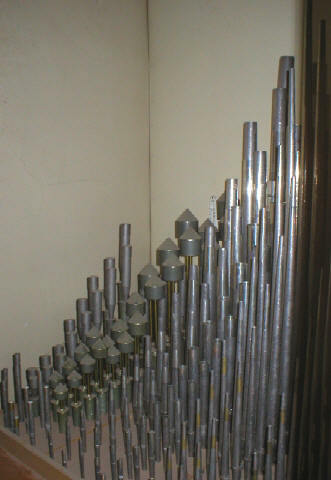 RIGHT: Partial view of the pipework comprising the 7 rank Antiphonal Organ installed in the rear balcony of First Christian Church in 1960. In the back is the original 1917 E. M. Skinner Vox Humana , designed to imitate the human voice. In front of it is the Kopf Regale, with its relatively large cylindrical resonators with conical-shaped caps. In front of it are the remaining ranks, including the Waldflote, Harfen Principal and tapered Erzahler and Erzahler Celeste.